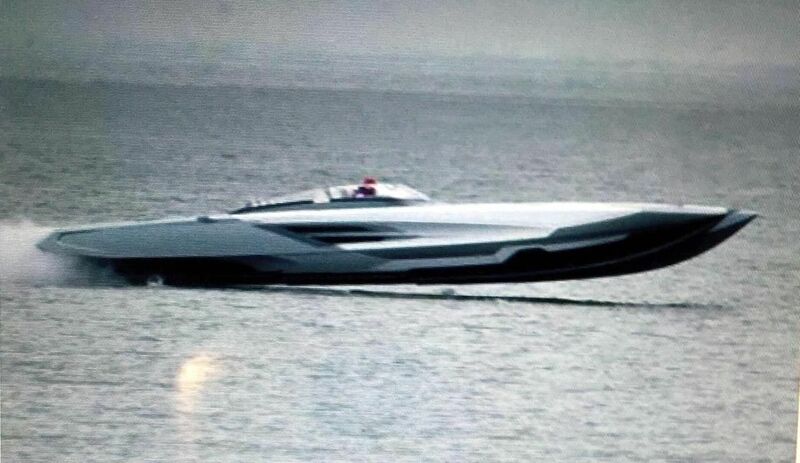 Serious Offshore - F-426 Skater, America’s Newest Stealth Fighter on Water? There is nothing that can be over-stated about the distinctiveness of the paint when compared to other high end performance boats on the water. The team assembled to design this scheme has to be ecstatic about the way it turned out. From the depicted air intakes on the sides, to the F-426 dash and custom designed and detailed fighter gauges, we must take our collective hats off to the overall implementation of what should be an instant classic. We are sure it is destined to be copied in several iterations by others as time goes on. After paint, it was evident this project was going to be something different than the average theme boat or wild custom-striped endeavor. Now, could it be kept secret so no half-baked copy would appear on the scene before the real deal was unveiled? It was up to everyone involved to do all they could to make sure a leak did not happen unveiling the distinctive paint scheme, and thankfully no leaks occurred. Installing Mercury Racing 1350’s with number 8 drives would make this a lot more than just some fighter jet schemed performance boat. Living up to that lofty depiction through acceleration and top end performance capabilities would also be in the grasp of this craft’s low-flying pilot. However, we here at Serious would not call it a stealth fighter at this point in time. The turbocharged performance engines may be quiet when compared to almost all other high horsepower engines, but subtle this catamaran is not. It does have subtleties in the paint and elsewhere, but it is more of an overall grab your attention, slap you in the face reaction it dishes out when you are seeing it in person for the first time. Just as with all Skaters, the attention to detail is outstanding from the smallest screw or wire tie, to the meticulous cockpit, drives, and engine rigging. As the countdown to the deadline for the Lake Of The Ozarks Big Cat Fest grew closer, the custom touches on such things as gauges and upholstery began to give a bit of concern of the timeliness for completion. Would the boat make it? Would the unveiling go as planned? What about finishing the custom tilt trailer? I guess we were worrying for nothing; it made it with at least several minutes to spare………. The unveiling at Lake of the Ozarks was a complete success. What the boat will do performance wise is merely a footnote to the overall impression this latest Skater creation will leave on those lucky enough to consort with this watercraft. It is, in our humble opinion, an awesome vision of tastefulness and refinement on the water. Seeing is believing! even if not. Your honesty is appreciated and extremely healthy for the progression of the industry! Hope you enjoyed the story. We were back down there a couple days after that day at lunch and I was a bit worried it wouldn't make it. I must admit, it really looks good. Pete's picture up first in the story shows how the paint makes the lines of the boat look completely different. I should be back down there next week to see how Ray's doing. The boat won its class at the Texas Outlaw Challenge Shootout. 161 MPH!! Well, I guess "What the boat will do performance wise" has just been answered.